Market continues to grind higher as risk diminishes. The market is continuing to benefit from banks pushing higher but the broader market was mixed with a lunch time sell off reversing into the close. BHP out of favour today as were CSL. ASX 200 up 15 to 5850 in lighter volume. Financials remaining strong on US counter-part results. Confession season begins. KGN positive.Soars. Energy stocks in focus. BHP slips but resources firm. Aged care Royal Commission starts in Adelaide tomorrow. HLS +2.58% media comments from Jangho help. WHC +3.74% quarterly report positive. KMD +3.10% appointment of President Oboz/Katmandu North America. DHG +3.18% bargain hunting following REA higher. WTC -2.08% profit taking in some tech names. KGN +22.15% positive revenue numbers. BIN -1.83% moves to quell ACCC concerns. BYE +10.64% South Marsh update. CCL – unchanged – wins back Pizza Hut contract. AGL -1.99% profit-taking. Has run hard. 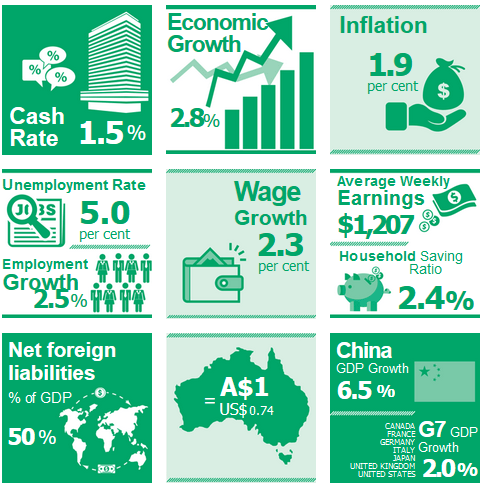 GOR +2.26% AUD gold price rising and broker upgrade. CLQ +12.36% bargain hunting perhaps? REG -2.09% Royal Commission kicks off in Adelaide on Friday. Speculative stock of the day: Vector Resources (VEC) +% completed its acquisition of the Adidi-Kanga gold project in the Congo. The project has a JORC Mineral resource estimate of 15Mt@6.6g/t for 3.2Moz of gold. The number of first home buyer commitments as a percentage of total owner occupied housing finance commitments rose to 18.3% in November 2018 from 18.1% in October 2018, well above the decade average of 17.7%. Woodside (WPL) +0.66% expects production of 88m to 94m barrels and investment spending between US$1.6bn and US$1.7bn in 2019. 4Q sales revenue up 43% to US$1.42bn, production up 10% to 24.1m barrels equivalent. Kogan (KGN) +22.15% business update. First-half revenue growth up 9.7% on year. Gross margins for the first half consistent with the previous period. Active mobile customers +75% year on year. Oil Search (OSH) +0.53% Pikka B well in Alaska encounters hydrocarbons as expected. Drilling began on 31st December and is now at 1201m. Orocobre (ORE) – unchanged – Q2 lithium carbonate production up 65% quarter on quarter, sales revenue up 1% to $32m, cash costs down 14% to $3,974/tonne and gross cash margin down 34% (excluding export tax) to $6,613/tonne. South 32 (S32) +% production of coking or metallurgical coal, rose to about 1.6 million tonnes in the December quarter from 788,000 tonnes a year earlier.The figure was substantially higher than broker estimates of 804,000 tonnes.It raised its 2018-19 guidance for production from its Illawarra Coal Project by 7% to an expected 6.5 million tonnes. Changes too to management as Katie Tovich has been promoted to CFO to replace Brendan Harris, who would take on the chief marketing officer role. The trend estimate for the total value of dwelling finance commitments excluding alterations and additions fell 1.1%. Owner occupied housing commitments fell 1.0% and investment housing commitments fell 1.5%. 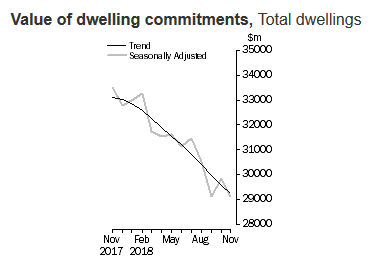 In seasonally adjusted terms, the total value of dwelling finance commitments excluding alterations and additions fell 2.5%. 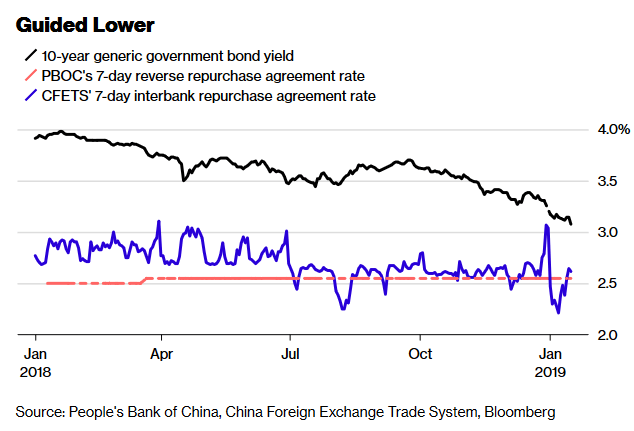 China is cutting borrowing costs as tax time looms and the Lunar New Year looks to take some liquidity from markets. Record one-day pump priming with US$169bn put into the money markets on Wednesday. Singapore’s non-oil exports posted the largest fall in more than two years in December. 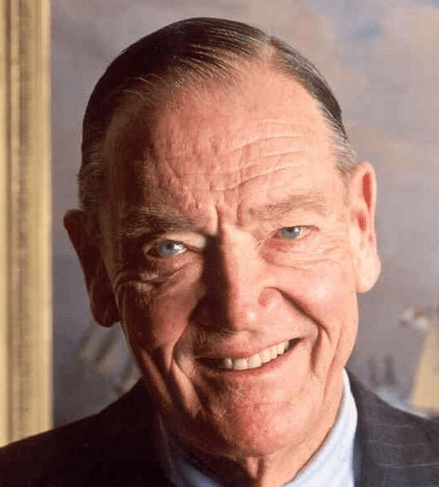 Vanguard founder and the pioneer of Index funds, Jack Bogle, has died. Vanguard now has US$5 trillion under management. Here come the good guys. Microsoft has pledged nearly US$500m to provide loans to boost affordable housing in its hometown of Seattle. Rare thing indeed. Beware of your solar panels spying on you as the US raises concerns about the security of Huawei’s solar panels. US authorities pursuing criminal charges against Huawei. More on Brexit: UK Chancellor has told business heads that Article 50 could be rescinded. All signs pointing to a delay at the least or ‘Brexit Lite’ in years to come. Theresa May has opened cross party Brexit talks. Just no sign of Corbyn though.